Taxi Driver is one seriously intense movie. I don’t know how you felt about it the first time watching it, but I felt a little bit wound up. I mean, you’ve got this guy driving around New York stalking people, trying to play the hero and he’s a lunatic. De Niro’s character is so mentally combustible that he could (and does) eventually snap. By defending the “innocent” and spewing his ideas about how “filthy” New York is, the dude is a little bit perturbed to say the least. If you mix equal parts righteous, crazy and vigilante, you get Robert De Niro’s character in Taxi Driver. The flick has action and drama as many of Scorsese’s films do, but more importantly it gets you inside the mind of one seriously messed up taxi driver. As De Niro romps around New York, his outfits aren’t too shabby for a militant taxi driver; in fact, I’d say he might be one of the best dressed drivers I’ve ever seen. With that being said, check out those glasses. 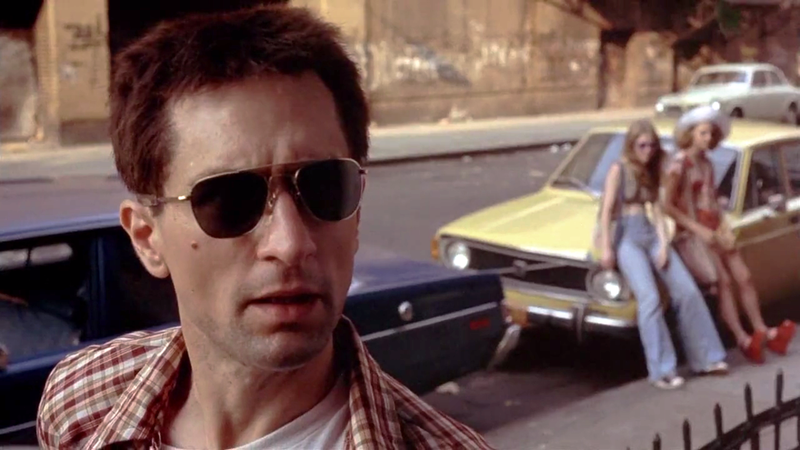 The Taxi Driver sunglasses (Ray-Ban Caravan) give a pretty intense feel to De Niro’s get up, and the squared off frames lend themselves to the look of that era. Sure, you could get the classic aviators of the time, but these guys are a little more in the obscure. Not everyone walking down the street has them, and let’s be serious; they look damn good. So what’s next? Grab a taxi, shave your head and go fight crime? Ehh, maybe not. If you’re looking to channel that 70’s flare, though, Taxi Driver Sunglasses are a good place to start. While the film may not make you want to be a taxi driver, it sure does get in to the gritty mind frame of some people who are out there. This psychological thriller is definitely worth the watch, and if you aren’t some vigilante deviant the Randolph Aviators are worth a look too. Hell, let’s be honest, even if you are a vigilante deviant Taxi Driver sunglasses will get you looking cool. 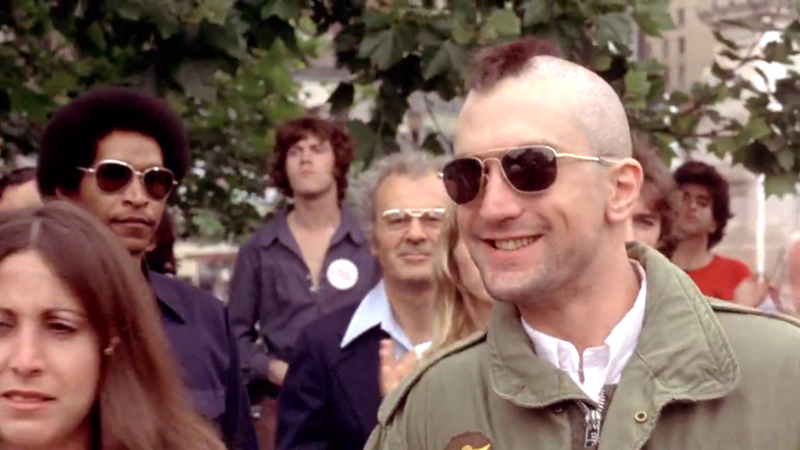 You might not want to emulate everything about De Niro’s character in Taxi Driver, but emulating his style can’t hurt. Let’s take a closer look at what the sunglasses have to offer. When these sunglasses arrive, they come in an official Randolph carrying pouch. This leather case is much like a protective carrier. It features a button press lock so that your shades do not fall off. You will be able to wipe stains on your lenses at any time since the package also comes with a Randolph cleaning cloth. The Randolph Aviators are the kinds of sunglasses that make a vintage fashion statement each time you wear them. They feature rectangular crystal green mirror lenses set on gold colored metal frames. The transparent temple tips help to expose the golden finish on the frames even more. For people who love wearing Randolph branded accessories, these shades feature the brand’s logo on the left lens and nose pads. Apart from giving you a stunning look, these shades also protect your eyes. The special protective coating on both lenses prevents the sun’s strong UV rays from harming your eyes. Unlike other sunglasses that are made of heavy metal frames, the Randolph Aviators are very light to wear. The fact that these sunglasses have been designed with nose pads means that they will not be slipping off that easily.